Catering to both, music lover and professionals on the go, the Jabra Elite 25e makes for a pretty decent pair of headphones utilising the neckband design. 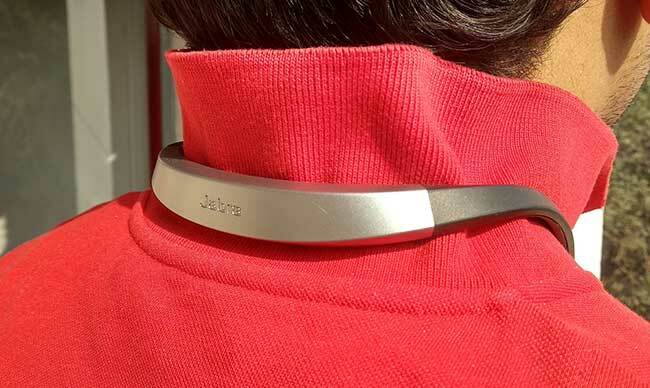 What’s good about the Jabra Elite 25e is that it has quite interestingly improved upon some of the shortcomings of the neckband design while staying classy. As is the trend with most audio devices these days, Jabra has included support for Google Assistant and Siri. All of these have been included for a price of Rs.3,999. The Jabra Elite 25e makes use of a variety of materials to ensure a balance between practical design and good looks. 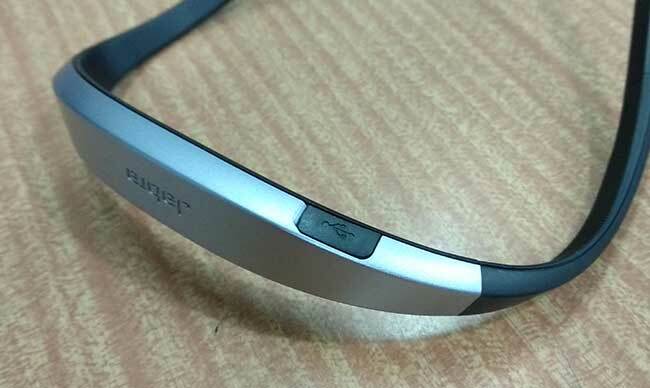 The neckband has a rigid back made of hard plastic housing the circuitry and the battery within. It packs a pretty powerful biased motor that vibrates with quite the intensity when you’re getting a call. Also, there’s a micro USB port for charging that’s sealed off with a hard rubber lid. The back extends on either side via two flexible segments that hold their shape quite well. Should you feel the default configuration is a bit too tight or loose, this is where you’d make all the adjustments. This flexible zone is marked out with a textured rubber lining so that you know exactly where to bend and don’t end up breaking the device. Then you have the rigid arms on either side which are again, made of plastic and have all the HID elements built in. 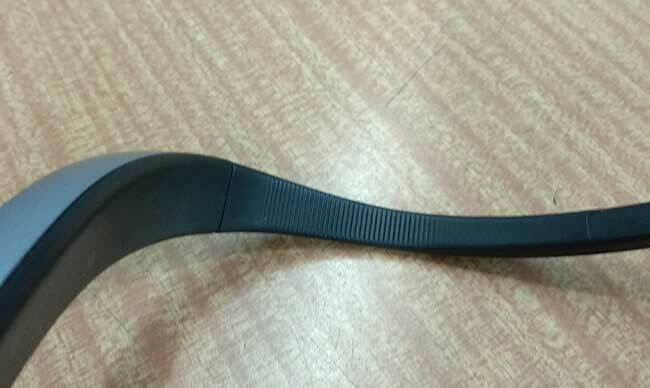 The left arm has the microphone grille along with activation button for Google Assistant or Siri. The right band has three multi-function buttons which follow the same set of functions as most wired/wireless headphone control pods. Extending from the arms are the tangle-free cables which terminate in the earbuds The cables have enough slack in them and don’t pull or tug no matter how hard you crane your neck. The ear buds are magnetised so that they stick together when not in use. 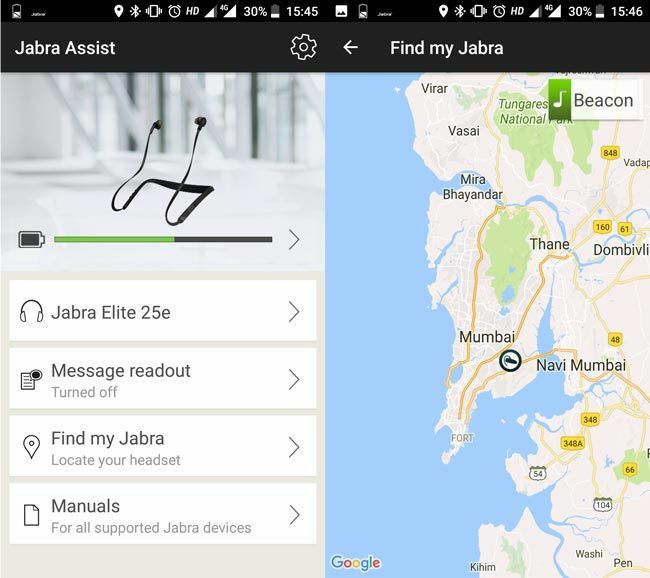 And since it’s easy to detect when the two buds have been brought together, Jabra has managed to make use of this to slip in some neat functionalities. You can answer a call by pulling the ear buds and similarly, you can bring them together to stop music playback or terminate a call. The ear buds themselves, are made of plastic on the outer surface while the inner surface which mates with your ear has a pretty thick rubber layer. This makes it enormously comfortable to wear for extended periods of time. 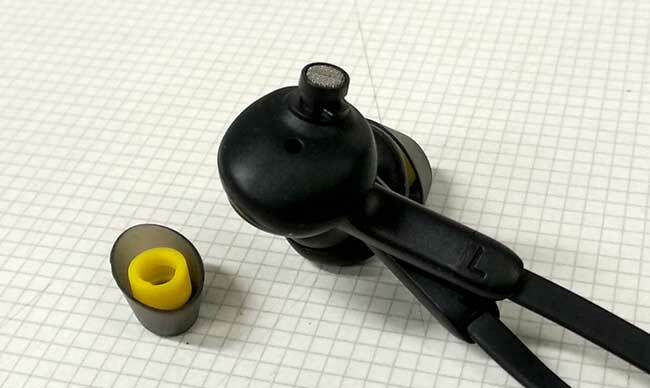 The Jabra Elite 25e comes with three pairs of tips in different sizes. They all make use of an oval design for the flange which works way better than the usual cylindrical design. 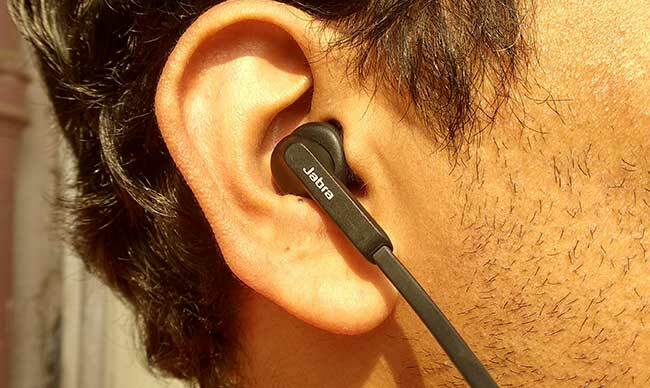 Jabra calls these tips EarGels and we’ll agree that these are really comfortable. We don’t know if you can use third party tips straight out of the box since there are small plastic notches on the ear buds to keep them upright when installed. You might have to make a few incisions on third-party tips before they slip on properly. 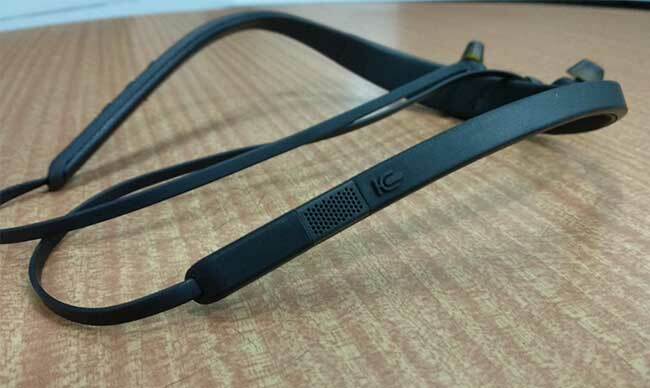 Overall, we’d say that the Jabra Elite 25e has done a great job of overcoming all the shortcomings of the neckband design. 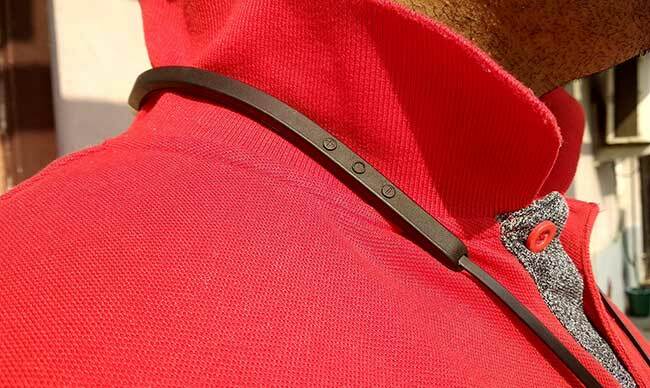 The curve of the neckband sits perfectly around your neck without any issues. Since the arms are not weighed down, the neckband does tend to slip off if you don’t adjust the clamping pressure. However, once you’ve bent it to suit your neck, it sits snug. The choice of materials and the IP54 rating ensure that these headphones are going to survive the daily grind better than most neckbands. 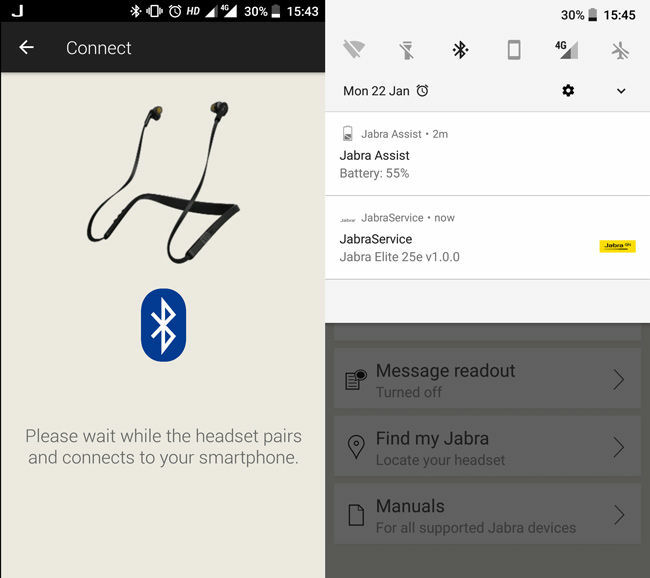 The Jabra Assist app isn’t that great of a value addition to the entire package. Sure, you have the ability to turn on certain features such as locating your device and message readout. The former works by storing the last known location where the device was paired so that you can trace your steps back. There’s no GPS module built into the headphones. The message readout feature, though useful becomes irritating real quick since most of the message you receive are all spam. So unless, you actually like knowing which stocks to buy or which piece of real estate just went for sale at “just 5% down payment”, the feature is best left turned off. You can even use the readout feature for your emails, which reads out the sender name and subject line. That’s one feature of the app which we liked. The Jabra Elite 25e has Bluetooth 4.1. While the protocol certainly can handle a range of 60 meters, these headphones aren’t set for the same. To save power, they’ve kept the range at 10 meters and it works wonderfully in most cases. We used the device extensively for quite a while and did come across a few anomalies. Given that they’ve scaled back on the transmission power of the device, it is quite prone to intermittent breaks. This becomes quite evident when you move around high tension wires with the phone in your pocket. You have to keep the phone out to ensure proper functioning. And even indoors, you can expect signal breaks if there are a couple of RCC walls in between. We tried the Jabra Elite 25e with 1, 2 and 3 layers of RCC walls and it worked wonderfully with just one wall in between. However, the moment you had two walls with the distance between receiver and transmitter at 5 meters, there would be a bit of disturbance. The disturbance was way worse with three RCC walls in between. So moving around with the phone kept at your desk isn’t a great idea. And lastly, there were instances where the device would disconnect randomly. Throughout our month-long experience with the Jabra Elite 25e, this happened twice. We’re more inclined to believe that this was because of the phone we used rather than the device itself. The microphone on the Jabra Elite 25e is omnidirectional and can easily pick up your voice when you’re facing straight ahead. The vocal clarity is top notch and it imprints a slightly flat tone to the recorded voice. The ambient noise cancellation works really well on the microphone. We even tried out the Google Assistant button and it worked just fine with about the same lag as seen normally on phones. Finally, the audio quality. The Jabra Elite 25e forms a pretty decent seal once properly worn and the overall sound signature weighs heavily on the lower frequencies. The highs and the mids are properly reproduced with minimal distortion. Even with the volume turned all the way up, we didn’t notice any significant distortion and the peak volume level seems just about enough to be audible for the slightly hearing impaired folk. We found most of the instruments to be properly audible at around 60-70% of the peak loudness. We liked the fact that the bass isn’t overwhelming when you are having a call. That distinction is a nice touch. The Jabra Elite 25e is rated for 18 hours of continuous usage. When we ran it at peak volume level, it lasted us just over 16.5 hours which seems to be quite decent. However, in terms of real world usage. With about 15-20 calls a day coupled with about 2 hours of music / videos, the Jabra Elite 25e lasted about 2.5 days easily. That’s really good for a pair of wireless headphones. The Jabra Elite 25e is a well built, well-designed pair of headphones sporting a classy look. 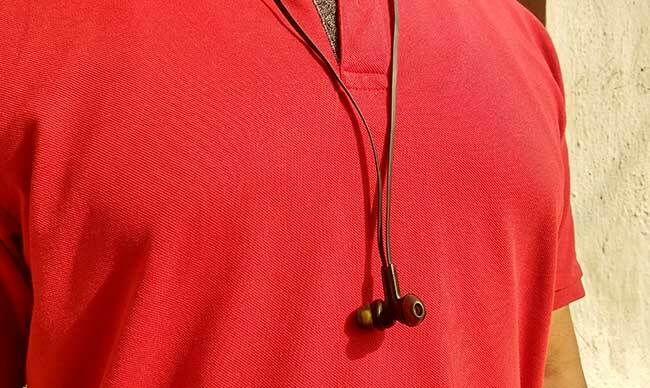 It’s not the first pair of headphones to adopt the neckband design but given the improvements it has brought to the design, we’re mighty impressed. Especially given that it’s priced at Rs.3,999. The audio signature is a bit bass heavy when in music mode but in voice mode, they’ve toned it down. Overall, we’re looking at a decent pair of wireless headphones with no shortcomings. is swipe elite plus a standard phone like redmi2prime?